Published: Oct. 9, 2012 at 03:50 p.m. 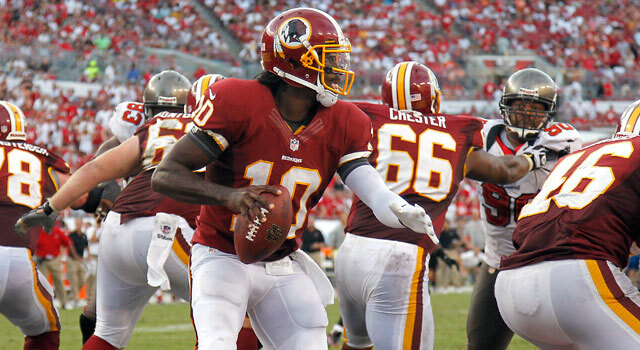 Updated: Oct. 9, 2012 at 05:02 p.m.
Five games into his rookie season, Washington Redskins QB Robert Griffin III owns a sparkling 101.0 passer rating. » Four things he's looking forward to in Week 6. » Gut check time for one preseason contender in the NFC. » Two fading college prospects who can change the narrative. At some point, the Washington Redskins' offense might once again look like the attack Mike Shanahan employed in Denver. For now, the coach knows better than to force that on Robert Griffin III. Like the Carolina Panthers did with Cam Newton last year, the Redskins are melding their philosophy and scheme with what their rookie quarterback is most comfortable doing, which is pretty different than what most NFL defenses are used to dealing with. On top of easing Griffin's transition, it's been functional enough for Washington to rank seventh in total offense and eighth in points per game. But the idea that this malleability is somehow new -- a thought perpetuated because option football is about as common as a 220-pound tackle in the NFL -- doesn't sit well with Shanahan. "You gotta go through generations," the Redskins coach said from his office on Monday. "Look at what we did with Steve Young, what he did, (John) Elway or (Joe) Montana, Brian Griese or Jake Plummer -- every offense should cater to the strengths of the quarterback. If you don't do that, you can't win. A quarterback like Elway was different than Young. Steve loved three- and five-step drops, Elway didn't. Elway loved the (shotgun), Montana would drop the snap intentionally in practice so they wouldn't run it. "Get a guy like Robert or Cam, and people see a different type of quarterback, and scheme, they say, 'Oh my God.' "
Which is Shanahan's way of saying what he's doing relates back to simple logic. Through five games, Griffin has completed 69.1 percent of his passes for 1,161 yards, four touchdowns and one pick, compiling a 101.0 rating. He's averaging 8.4 yards per attempt (second in the NFL) and 5.7 yards per rush (second in the NFL among players with at least 40 rushes). And this after coming from an offense at Baylor where there was no playbook, no route tree, players received calls from the sideline, and everything was based off the threat of Griffin running the option. "What we've done over time is develop to where we're only doing things Robert is comfortable with," Shanahan said. "He's a rookie. You have to do that. So we put the offense in over the first two weeks of OTAs, and the first two weeks of camp, and we saw what he was comfortable with. Over a time frame of about three years, we'll put everything in, and he'll really be able to branch out. But initially, we're gonna do what he does well." Thus, the Redskins are running a hybrid offense. Shanahan spent time with Urban Meyer when he was coaching Florida a couple years ago, and has taken elements from that offense. Shanahan also picked up aspects of Oregon's offense, and yes, Baylor's attack, as well. He studied what the Denver Broncos did with Tim Tebow, and Carolina with Newton, learning lessons to help shape his RG3 game plan. And the option game isn't new to Shanahan, either: His first coaching job was with the 1975 Oklahoma Sooners, who ran a wishbone offense. Back then, he was told the 3-4 defense the Sooners ran would never work in the NFL. That, of course, sounds foolish now; equally foolish, Shanahan thinks, to the notion that the option, as an element within an offense, isn't truly viable in the pros. You just need to have a guy like Griffin to run it, and then teach that player to be judicious. "It's pretty natural for him to go through the reads, that part's easy for him," Shanahan said. "What we have to teach him is you don't have to run; sometimes it's better if the other guy does. And if they take away both, it's when do you slide? When he was in college, he was so fast, that chances are if he gets in the open field, he's gone. Here, sometimes, it needs to be 10 to 12 yards and then slide. And there's nothing wrong with that. It's just learning to slide." Shanahan says that Elway, in fact, used to have a similar problem, running too aggressively. "Everybody does until they get drilled," Shanahan said. He expects his new quarterback to learn to dial it back. In that vein, Shanahan is quick to note that Griffin's concussion came on a scramble play, not a called run, where the quarterback can better protect himself with a better idea of his surroundings and how the play will develop. As for the idea you need a good backup, Shanahan agrees that depth is important, but says Griffin's style wasn't the reason they backstopped the position with Kirk Cousins in the 2012 NFL Draft. Shanahan says that pick happened because Cousins "was a steal in the fourth round." For now, all of this makes the Redskins tough to prepare for. It's safe to say the Atlanta Falcons spent considerable time prepping for the option last week. And Washington didn't run it once. Assuming Griffin stays healthy and keeps developing -- seemingly fair bets -- where does the Redskins' offense go from here? That is what's really intriguing. Shanahan himself doesn't know what it'll look like two or three years from now, only that the quarterback's aptitude makes the growth potential boundless. "He's very bright and he adjusts quickly," Shanahan said. "Everything we throw at him, he picks up quickly." So it makes sense that Washington will continue to become more varied, versatile and different. And thus, Griffin figures to become even more difficult to defend than he already is. 1) Whether or not the Ravens can get to Tony Romo. Baltimore's pass rush has been the primary problem for a defense that ranks 24th in the NFL through five weeks. The Ravens have been able to mitigate the problem to this point by ranking third in the league in takeaways and seventh in points allowed, but they've had to pull out all the stops schematically to try and get to the quarterback. This Sunday's game against Dallas provides opportunity, with the Cowboys' offensive line struggling. The real fix for this issue could be the return of Terrell Suggs, which might happen as soon as early November (he'll be eligible to come of the PUP list next week). But it's important to remember there will be a re-acclimation period for the reigning Defensive Player of the Year. Bottom line is the Ravens need their young guys to develop as viable threats. It's worth watching Courtney Upshaw and Paul Kruger in the two games leading into the team's bye in Week 8. 2) Wes Welker's snap count. On Sunday on Comcast SportsNet New England, Welker was asked about his expanded role (and production) since Aaron Hernandez and Julian Edelman went down. He responded, with a smile, "It's nice to stick it in (Bill Belichick's) face every once in a while." Before that, I'd asked him on the field after the gun sounded Sunday whether it was personally satisfying to put up the big numbers after what he went through in Weeks 1 and 2. He said, "It's always satisfying, especially when you win the game. It seems like all the games when I've had big games, we wind up losing." Sounded weird, so I went back and looked. Welker has had 26 100-yard games as a Patriot, and the team is 20-6 in those. Maybe he was firing back at rhetoric he heard somewhere? Either way, it seems fairly obvious his words have some bite. These have been a few frustrating months for Welker, and for him to release some of those feelings after a big game would be, well, very human of him. Should be interesting to monitor this one going forward. The team has targeted Sunday's game against Seattle for Hernandez's return. That could eat away at Welker's snaps. And it'll be intriguing to see if Edelman remains in front of Welker on the depth chart when he returns. 3) How the Vikings use Percy Harvin this week. Because every week, it seems like there will be something new for Harvin. "That coaching staff has done a great job of game planning for (Christian) Ponder, and finding ways to get Percy the ball," one pro scout said. The scout also said he thought the Harvin MVP talk is "a little bit of a stretch, but he's a huge part of their success on offense." Lots of what Shanahan, whose team will have to defend Harvin this week, was saying above is based on how pro coaches have no control over their farm system (the college game), which means they have to be adaptable to play to the players' strengths. Harvin is a good example of one such player, where the lines between different skill positions are blurred and a coach's flexibility can be important in maximizing an athlete's talent. Seems like Minnesota offensive coordinator Bill Musgrave gets that. 4) Gut check for the Lions. Safe to say, the first four games of the season haven't gone as planned for Detroit. With the emergence of the Vikings, it seems clear climbing out of a hole will be even tougher in the NFC North than initially believed. The Lions' rough start for wasn't unpredictable. The club is coming off a breakthrough season, is facing a more difficult schedule and had a long offseason marred by a string of player arrests. It's easy to forget that much of the leadership of this team is in its mid-20s, making it more difficult to rein in things when problems arise. Long term, this is still a team on the rise. In the short term, though, this is a critical week. Coach Jim Schwartz had the bye to try and right the ship, and a trip to Philly gives the players a chance to seize a potential turning point. What's certain here is the club needs to start building capital now. On the back half of the slate, Detroit gets Green Bay twice, Houston, Atlanta, Chicago, Arizona and Minnesota. 1) Peyton Manning showed good signs Sunday, even in a loss. I was on the field when the Broncos got the ball with 5:19 left, down 10 in Foxborough. As the offense started to drive, it began to feel like the comeback Manning pulled off against the Patriots in 2009 could be replicated. A fumble by Willis McGahee (credit Rob Ninkovich with a heck of a play to jar it loose) did in Denver, but before that miscue, the tide was turning -- as it should continue to turn, from a more global perspective. Archie Manning told me last week, "It's a process. It's a combination of his health and his new team, it's new everything for them. You couldn't tell much from the preseason. And Peyton said after Pittsburgh, you can't read too much into the good of that one, just like you can't read too much into it when it wasn't too good against Houston or the Falcons. The whole thing is a process for him, to see where he's at. They're trying to build an offense. And I've said all long, if the players stay healthy, it makes sense that they'd be a better second-half-of-the-year team." To me, that makes perfect sense. 2) Mike Vick's problems are correctable. The question is how long it'll take Vick to fix his fumbling issue, and whether or not another problem will result from the correction. The Philadelphia Eagles quarterback told me a few weeks back that the rib injury he suffered against New England in the preseason showed him that he simply had to play with abandon and stop thinking so much. That said to me that he felt limited when he was thinking too much about getting hurt. And this might be the reverse of that, where freeing his mind has made him a little too careless in another area. Because Vick's such a unique talent, striking a balance in his playing style has always been a challenge. We'll see if he can fix it, without slipping elsewhere. It's hard to imagine the Eagles giving up on Vick this year, but the presence of Nick Foles could color decision making at the position down the line. And then, there's this what-if: The Eagles were leaning strongly toward drafting Russell Wilson with the 88th pick ... before Seattle grabbed him with the 75th selection. Which could've made this situation even more interesting. 3) The Jets aren't going to fall apart completely. Rex Ryan's crew lost Monday night, but that group certainly didn't embarrass itself either. Playing without Santonio Holmes, Darrelle Revis, Dustin Keller and Stephen Hill, coming off an embarrassing 34-0 home loss to the 49ers and eight days packed with folks rubbernecking Florham Park, the Jets hung with the Texans all night. And that was despite a bad three-and-out and a breezy Houston offense to start the game. The Jets are undermanned right now, and in the end, they might not wind up being very good. But Monday told me they'll continue to compete. Remember, this is a team that two years ago lost 45-3 to the Patriots on a Monday night in December -- a doomsday scenario similar to this year's Niners loss -- and wound up in the AFC title game the next month. So at the very least, Rex's Jets have proved resilient in the past. 1) LSU DT Bennie Logan (vs. South Carolina, 8 p.m. ET, ESPN): Coming into this season, Logan, who played alongside Michael Brockers in 2011, was seen as the next great LSU defensive lineman. It hasn't worked out that way through the first six games. "He needs to get to the quarterback more often, even considering hurries," one NFC team executive said. "He's not having a very productive year to this point, but he definitely has talent." Last week, the Tigers yielded 176 yards rushing, an incomprehensible number for that defense, in their loss to Florida, and much of it came right up the gut and past Logan. This week, the Tigers encounter South Carolina stud Marcus Lattimore and a ground attack that's averaging 181.5 yards per game. With that, Logan gets a golden opportunity to atone. 2) Oklahoma QB Landry Jones (vs. Texas, Noon ET, ABC): Jones' numbers haven't plummeted, but his stock has in the eyes of NFL folks. "He would've been a late-first or early-second (round pick) last year," one college scout said. "Now, he looks like a mid-round pick, based on this early part of the year." One of the primary issues? How Jones reacts to adversity. The scout said Jones "has all the tools we look for in a quarterback, but if he gets hit a couple times, he's done. Lots of skill, absolutely -- great size, good arm, accurate, tons of production the last three years. But he's killing himself. ... He shows he can do everything we want him to do, he just hasn't shown he can do it consistently in pressure situations. He's great if his team gets a lead early and mixes it up on offense. If they get behind, and he's got to lead them back with a defense pinning their ears back, he struggles." As is the case with Logan, a big game and national spotlight provides a chance for Jones to change the narrative. All the hubbub over the possibility that Sunday would be the final Tom Brady-Peyton Manning game will wind up being white noise. New England is winning its division. And Denver looks like the best of a mediocre AFC West lot. Which means, by the scheduling formula, the teams would meet again in Foxborough in 2013. But talking with Brady last week, it was clear he does have quite an appreciation for Manning, and that playing in a 2011 season without him was, at the very least, a little strange. "He was always the guy who never came out," Brady told me. "He played so many games, he's so tough, and then he went through something you can't be tough with. You get new perspective when that happens. With my knee (in 2008), you play through so many little injuries, and then something like that happens, and I just realized how much I love all of it, being in the position we're in. "How much I love the little things, and not to take those for granted -- you realize how much you miss the game plan sessions, the bus ride to the stadium, the funny moments you have with your teammates. All those things are so much of why we love playing the sport." Let's hope both he and Manning get to enjoy plenty more of those moments going forward, so we get at least a few more chances to see the two icons meet.